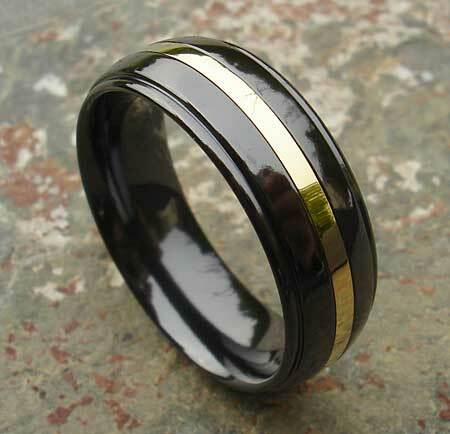 Men's Black & Gold Wedding Ring : LOVE2HAVE in the UK! 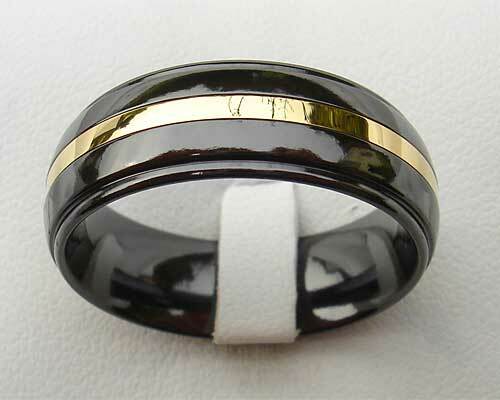 The good-looking men's wedding ring listed here in black and gold is a fantastic example made from zirconium and measures 7mm wide. It is fashioned into the classic domed shoulder cut profile and centrally sits a 9ct yellow gold inlay that measures approximately 2mm wide. The finish is all over polished, and the contrast between the two metals is just stunning, and something we think is very different. As you are likely to be wearing your wedding ring for very extended periods you need a metal that won't react with your skin. Zirconium's hypoallergenic qualities rid you of any worries over skin reactions or allergies that some people may suffer from when wearing precious metals. Zirconium, therefore, makes an excellent choice for men looking for an unusual wedding. Metal(s)/Material(s) Available: Zirconium and 9ct yellow gold.